Here’s what started my fascination with the recent past. 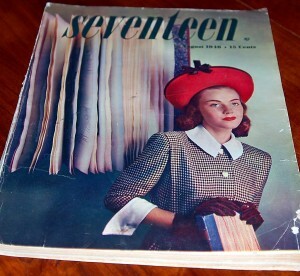 I have had this August 1946 issue of Seventeen Magazine since I had a subscription myself. I’ve thumbed through it (oh so carefully) for years, then wrapped it in plastic and stored it away. I rediscovered it recently and was just as enamored as I was when I was sixteen. The fashion, the articles, and the way of life that the words and images depicted was like reading a fantasy novel. I would stand over the counter eating microwaved leftovers while my mom was at work, pondering a world where at age seventeen I might be considering both college and silver patterns. Where I could go see a new Audrey Hepburn movie at the theater. Where feminine hygiene involved belts (what?!?). As a wife and mother today, the fascination has definitely been rekindled. But I’ve graduated from Seventeen to Woman’s Home Companion. Hello, 50’s housewife. How did these women do it? If I am to believe magazines, TV, and movies, they made sure their children were well-behaved, kept a spotless home, and had dinner ready when their husbands walked in the door. All while wearing heels and a smile. How did they do it?? So for the next couple weeks, I will be researching the day to day life of the average 1950’s housewife and putting it into action for one day. At this point, I’m thinking heels and pantyhose, dress, up-at-crack-of-dawn, house clean, dinner ready…any suggestions? So back to the name. Bold Sparrow was not my first choice for the name of my Etsy.com store. In fact, it wasn’t the second, or the third. It was a name I settled on when I simply had to. At first, it sounded great. Twenty-four hours later, however, I thought it was terrible. Ridiculous. Meaningless. However, in light of the 1950’s housewife, I now find it quite befitting. The perfect little housewife is the sparrow, and I am the bold part…but more on that later. This post is long enough. With this site, I intend to truly explore the antique and vintage items I am selling in my etsy shop: http://www.etsy.com/shop/BoldSparrowVintage Most of my interest centers around the life of the 1950’s housewife, and many Bold Sparrow goods and wares reflect this interest. 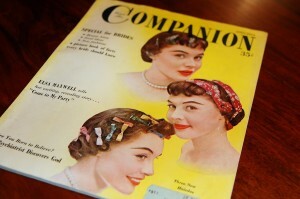 They include such items as: women’s magazines, jewelry, housewares, textiles, accessories, etc. At this point, there will be a bit of flux as my venture finds its footing.